ALPHARETTA, Ga., September 12, 2013 – Solvay Specialty Polymers has conducted an extensive study that supports the use of overflow tabs as a method to improve weld line strength of injection molded structural components. 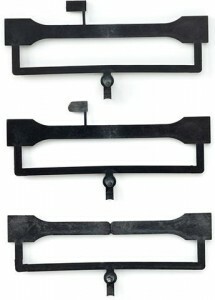 The technical study, which examined structural parts made of Solvay’s KetaSpire® polyetheretherketone (PEEK) and AvaSpire® polyaryletherketone (PAEK) resins, revealed a minimum increase of 50% in flexural strength for all materials using two-gate designs with an overflow tab compared to two-gate samples with no tab. For designers and OEMs, the study demonstrates a unique way to improve weld line quality for reinforced materials compounded with mineral fillers and fibers. “The study confirms that weld line strength can be optimized for our reinforced grades of KetaSpire® PEEK and AvaSpire® PAEK by using overflow tabs, thus providing greater overall performance in structural applications and enhancing their use in demanding environments,” said Guy Van Meulebeke, CAE senior specialist for Solvay Specialty Polymers. As a rule of thumb, the strength of a reinforced polymer with a weld line is typically reduced by about 50% compared to a reinforced polymer with no weld line, according to Solvay. This is due to an unfavorable orientation of the fillers at the weld line with respect to the load direction. 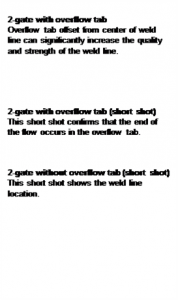 An overflow tab (also known as spillover, relief tab, or overflow well) favorably changes the fiber orientation distribution. To quantify weld line quality, a test specimen mold was modified to create an overflow tab. 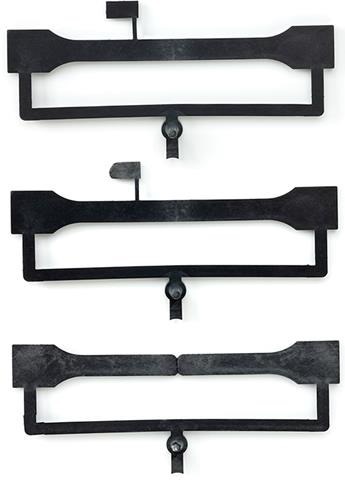 Three different types of test samples with a 4-mm thickness were made of reinforced grades of KetaSpire® PEEK and AvaSpire® PAEK. The overflow tab was positioned slightly off center from the weld line where the plastic flow ends, thereby creating an underflow in the molten layer that disturbs fiber orientation in the region. Flexural strength increased by more than 50% for all materials and jumped 160% specifically for KetaSpire® KT-820 SL30 PEEK, a friction and wear grade. 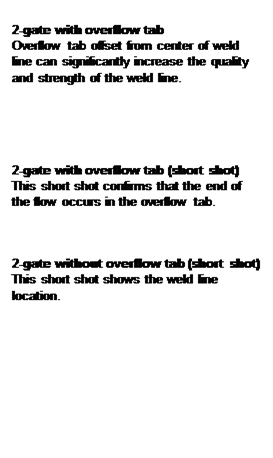 In all cases, the flexural strength of two-gate samples with tabs was only 15% to 20% less than one-gate samples with no weld line.Solvay reminds processors that the position and design of the overflow tab depend on the part design and must be carefully optimized. The company has successfully implemented overflow tabs in a variety of part designs using reinforced grades of KetaSpire® PEEK and AvaSpire® PAEK resins. KetaSpire® PEEK is one of the industry’s most chemically resistant plastics and offers excellent strength, superior fatigue resistance, and a continuous-use temperature up to 240°C (464°F). Glass fiber-reinforced and carbon fiber-reinforced grades provide a wide range of performance options for demanding applications. AvaSpire® PAEK is a family of polymers that delivers new and unique combinations of performance and value. The AV-600 Series delivers a range of distinctive performance attributes with some grades offering more attractive economics when compared to PEEK. The AV-700 Series offers comparable performance to PEEK at up to a 30% lower cost.